Plans to expand Ebola screening to more airports across Britain should help reassure passengers travelling abroad. For many it may have seemed that the health crisis was a million miles away, with most of those infected living in Africa. But the emergence of cases in Europe and the US have caused concern closer to home. 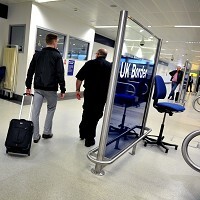 The outbreak has encouraged the UK government to take action, and screening at airports of people entering the country from certain areas of West Africa will now be a far more common sight. Measures are already in place at Heathrow and Gatwick, as well as the Eurostar terminal at St Pancras. Once officials are satisfied the measures are working smoothly at these locations, they intend to start screening at airports in Birmingham and Manchester. The crisis will have prompted travellers to consider taking out medical travel insurance and - while the risks of Ebola are not great unless visiting infected areas - it is always handy to have such cover in case of other emergencies while abroad. Chief Medical Officer Dame Sally Davies describes the risk to the UK as "low", but Prime Minister David Cameron is worried that the quality of checks in other European countries may not be of the same standard as those in Britain. Becoming infected with the Ebola virus is unlikely in the UK unless you have travelled to areas infected with the disease or had direct contact with a person with Ebola-like symptoms. While the virus could arrive in the UK by plane, there are a number or reasons why a rapid spread of the disease is doubtful. - The virus is not as easily transmitted as a respiratory virus such as flu. - People with Ebola are not infectious until they have developed symptoms, such as a fever. The disease then progresses very rapidly. This means infectious people do not walk around spreading the disease for a long period. - Britain has a resilient public health system with the necessary staff and facilities to contain cases of Ebola. - Border Force have been trained to identify possible cases of Ebola, while f light crews know how to respond quickly to any passengers who develop symptoms during a flight.